Rapper Logic Dons "F*CK THE WALL" Shirt At VMAs - Joe.My.God. 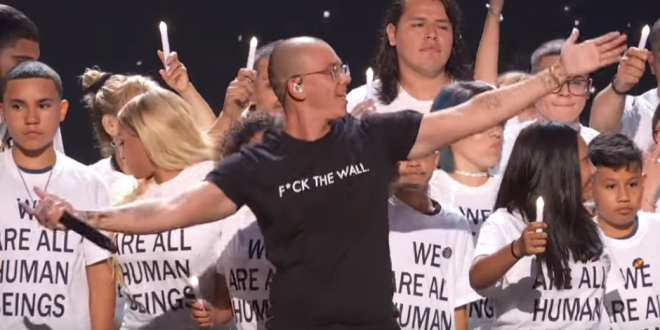 Logic delivered another powerful performance at the MTV Video Music Awards on Monday, using a backdrop of immigration illustrated by a U.S. Border Patrol graphic and a T-shirt that read “F— the Wall,” referencing President Donald Trump’s proposed border-crossing deterrent. The immigration-themed set featured dozens of advocates for immigrants’ rights and others displaced by Trump’s policies at the border. Civil rights organizations have also fought to keep DACA, or Deferred Action for Childhood Arrivals, following Trump’s attempts to end the immigration policy. Former President Barack Obama created the program to protect young undocumented immigrants from deportation.